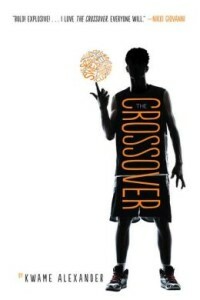 *The Crossover by Kwame Alexander. Harcourt Mifflin Harcourt, 2014. 237 pages. Bottom line: The Crossover, a verse novel for middle grades, is an exuberant, touching, and funny tribute to basketball and family. Basketball Rule #1: In this game of life/ your family is the court/ and the ball is your heart./ No matter how good you are,/ no matter how down you get,/ always leave your heart in the court. If anyone was born into a charmed family circle, it’s Josh Bell. His father Chuck “da Man” Bell earned so much money playing basketball in Russia he’ll never have to work again, just spend his time coaching his boys. Josh and his brother Jordan (JB) are identical twins, “and if we didn’t love each other we’d HATE each other.” Love wins out, in spite of the tussles and contests; in fact the whole family seems crazy about each other, with just a few ongoing conflicts to keep it interesting. Like Josh’s constant vocabulary building, which has the added value of irritating his brother. And their mom, who is also assistant principal at their school, continually riding herd on Dad’s propensity for fried chicken and Chinese take-out. And Dad’s occasional shortness of breath and bursts of temper. But it’s not until JB acquires a girlfriend that things go seriously out of whack. Girls upset the balance and break up the cozy familiarity, causing Josh’s anger to build and build until . . . but that’s not the worst thing. Verse novels generally don’t have much plot but they have lots of heart, and this one scores big in the heart department. The language is bouncy, sinuous, extravagant, plain, direct, and poignant, especially during the game sequences, where the font darts and weaves all over the page. Even though the Bells go to church, so we assume they ascribe to some religious faith, there are no overt references to God–their real faith seems to be in family. And as we’ll see, the family makeup will change. In fact, it’s designed to change: to expand and contract, to shift and grow, to celebrate victories and suffer losses. One function of family is teaching us how to deal with genuine conflict, like when your brother lets you down and “his eyes, empty as fired cannons,/ shoot past me.” How do you handle rejection? I would have liked to see some acknowledgement of a guiding providence, but the drive and gusto and exuberance of The Crossover, backing up the family’s deep love for each other, makes this novel a joy to read and an overall winner. UPDATE: The Crossover won the 2015 Newbery Award for excellence in literature for children. I appreciate your thoughtful and thorough reviews. Katie–We appreciate your reading them!